Classical Music Pages' George Frideric Handel -- from "The Grove Concise Dictionary of Music"
The "Case" of George Frideric Handel -- by William A. Frosch, M.D. Teri Noel Towe's "The Portraits of George Frideric Handel"
Classical Music Pages' "Handel Picture Gallery"
Handel portrait prints for sale! Robert Poliquin's "catalogue des oeuvres HWV"
Gerald Coke Handel Collection at the Foundling Museum –ß The Handel collection is an internationally important collection of material relating to Handel and his contemporaries, including manuscripts, printed books and music, libretti, paintings and engravings, memorabilia, art works and ephemera. The materials were collected by Gerald Coke over a period of 60 years and left by his widow to the Coram Foundation, a childcare charity which is the successor of the 18th century Foundling Hospital, of which Handel was a Governor and benefactor. Tom Lumb's "Standing for the Hallelujah Chorus"
Joel Kasow's "Handel operas: new releases"
Suzanne Aspden's "The Rinaldo story"
Stanford University -- scroll down to "Haendel"
Handel Scores: Once you've accessed the Bärenreiter website's welcome page, from the composer/author pull-down, select "Händel". Alternativey, you may wish to perform a "Detailed Search" instead. MuseData's Handel scores [MuseData is a project of the Center for Computer Assisted Research in the Humanities (CCARH) at Stanford University]. 'Too Hot to Handel' -- a jazzy, soulful reinterpretation of Handel's Messiah. Thirteen Colonies Press' "Handel: English Country Dances"
"Classical Kids" recording of Hallelujah Handel! -- "a recording devoted to the life and music of Handel, told through the eyes of a child." NOTE: Most countries around the World use one of three main television broadcast standards: NTSC, PAL or SECAM. These apply to both VHS and DVD. Hence, videos/DVD from one region may not be viewable from another region. 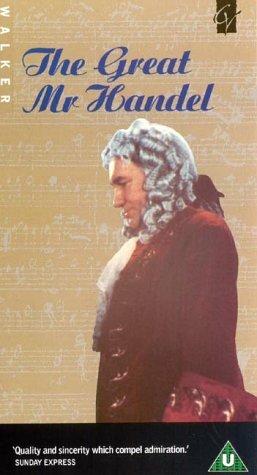 "The Great Mr. Handel" - A film produced in 1942 by Lord Ranks G.H.W. Productions Ltd.
Glyndebourne store. (Enter "Shop", then select "Glyndebourne Video Gallery". Videos in VHS/PAL format). Theodora, presented by James Naughtie. Handel - Catch the Thief! Donald Burrows' "Handel's first Foundling Hospital concert"
Donald Burrows' "Christmas with Bach and Handel"
Maitreya Sangha's "George Hendel (sic) Memorial"
Volume IV of Charles Burney's "A General History of Music" -- Handel is frequently mentioned in this volume. Chrysander (with Max Seiffert's assistance and under the auspices of the German Handel Society) was responsible for the 100+ volume complete edition of Handel's works. The Masque Affect -- A musical by d'masque productions inc. Here Of A Sunday Morning's (HOASM) Handel.